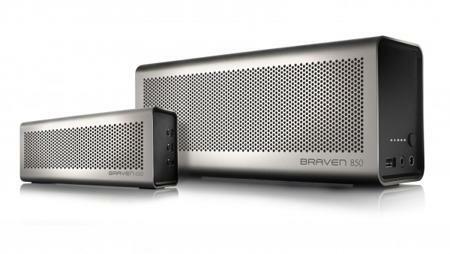 When it comes to portable speakers that appeal to the senses, I am quite sure that a fair number of you out there have already heard of the name Braven in the past. After all, Braven has had a pretty good track record when it comes to portable speakers as we have seen in the past, and this time around, Braven has just announced the arrival of their highly-anticipated Braven 850, which has been touted to be the biggest and most audiophileistic (is there even such a word?) Braven device to date. The Braven 850 is capable of pumping out hair-raising high-fidelity audio, all the while babysitting mobile devices by charging them, apart from pairing up with a second Braven 850 speaker sans wires for a true left and right wireless stereo experience. Measuring under 10” in length and 4” in height, the Braven 850 might be small in size, but you can bet your bottom, hard earned dollar that it is big in performance. The bark is worse than its bite in this case, where Braven 850 delivers unprecedented portable sound, with more than enough punch to fill up larger rooms and outdoor parties without breaking a sweat. This is made possible thanks to the Braven 850 making use of class-leading extended-range aluminum cone drivers as well as dual passive radiators, allowing it to open up a path for a powerful and rich sound which should be more than capable of pleasing even the most discerning and demanding audiophile. Without straying too far away from the classic Braven design, the Braven 850 is accentuated by a stunning unibody aircraft-grade aluminum construction. There are also several advanced multi-functional features such as on-the-go charging of mobile devices including smartphones, cameras, iPads, and tablets among others, True Wireless pairing between two 850s for a left and right channel stereo experience, an integrated speakerphone so that you can carry out hands-free calls, and a unique digitally enhanced audio that is based on DTS Audio’s SRS WOW technology. It also comes with an impressive play time of up to 20 hours, all for $299.99 a pop. $600 for a stereo pair of these? Epic fail!